If you live in Kansas long enough, you really begin to appreciate trees. They endure heat and extreme cold along with persistent wind. 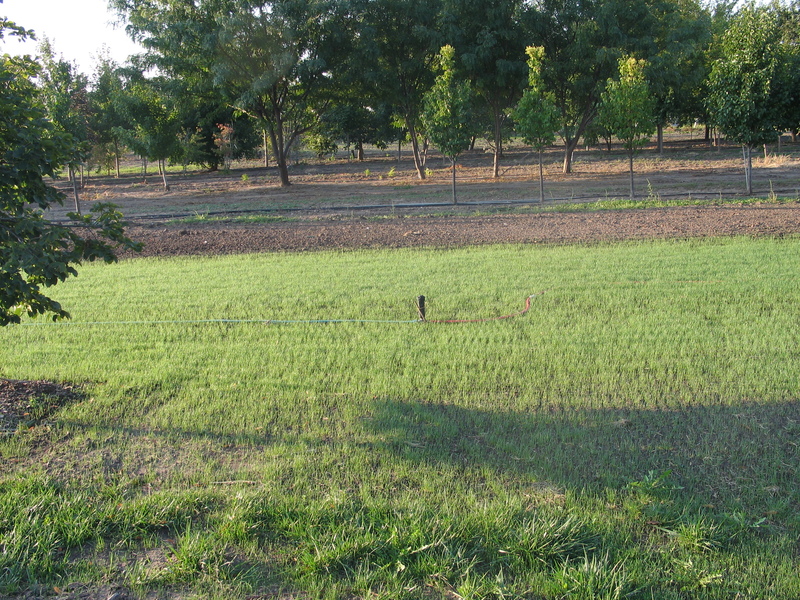 Months without rain are common, but so is the occasional soaking rain that saturates the soil. Trees in this part of the world need to be resilient. Folks in areas of the country that have an abundance of trees often take trees for granted. Trees grow easily, but not here. A good shade tree in Kansas is a luxury. They need to withstand the rigors of the climate. To sit under a mature tree on a warm afternoon, enjoy the blue skies and sip your favorite cool drink is a special experience. When I go fishing along the Cottonwood River, I can’t help but notice the huge Bur oaks (Quercus macrocarpa) stretching out their limbs over the river. West of Hesston, there is one that has a span of over 150 feet. It is quite a specimen. This native oak of the eastern two-thirds of Kansas is one of the most adaptable hardwood trees in Kansas. Generally, it is slow growing, but in the right conditions it can grow two to three feet a year. Mature height is 50 to 80 feet tall and with a spread from 40 to 60 feet. 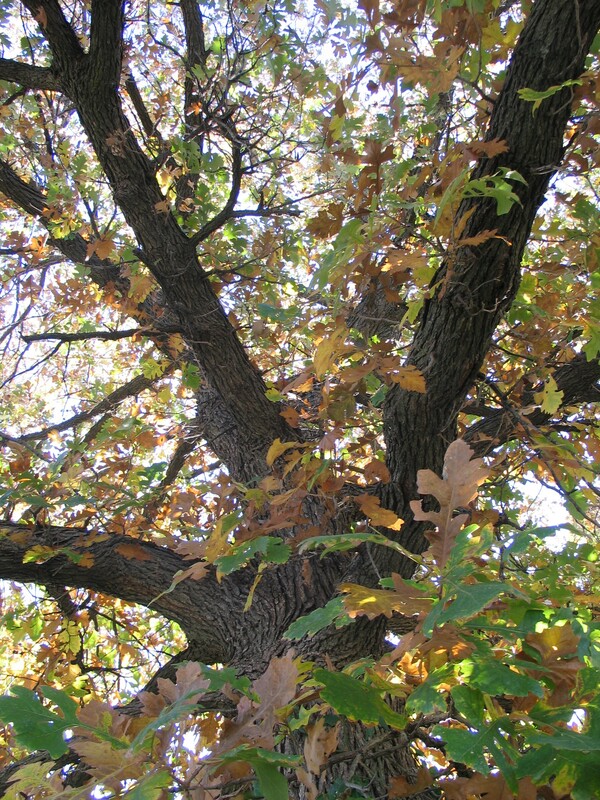 The Bur oaks don’t typically have great fall color, but it is very sturdy and problem-free. As part of my horticulture classes at Kansas State University, I had to learn the names of many different plants on campus. One of the trees I remember the most is a white oak (Quercus alba) on the east side of campus. It is a beautiful tree with great fall color. This stately tree stood about 60-70 feet tall with a spread of at least 60 feet. I would love to have that white oak in my back yard, because I know that it would be there for generations. The Kansas state champion English oak (Quercus robur) is in Kinsley. If it can grow in Kinsley, it can grow anywhere in the state. 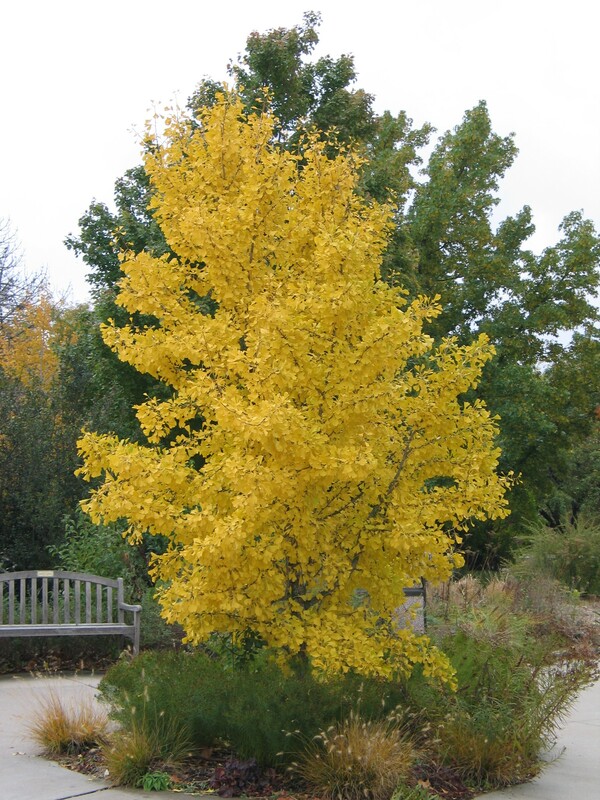 It is native to Europe, but a versatile tree in Kansas. Typical growth is 30 to 50 feet in height and 30 to 40 feet in spread. Leaves are dark green throughout the year. They eventually turn brown, but stay on the tree much of the winter. 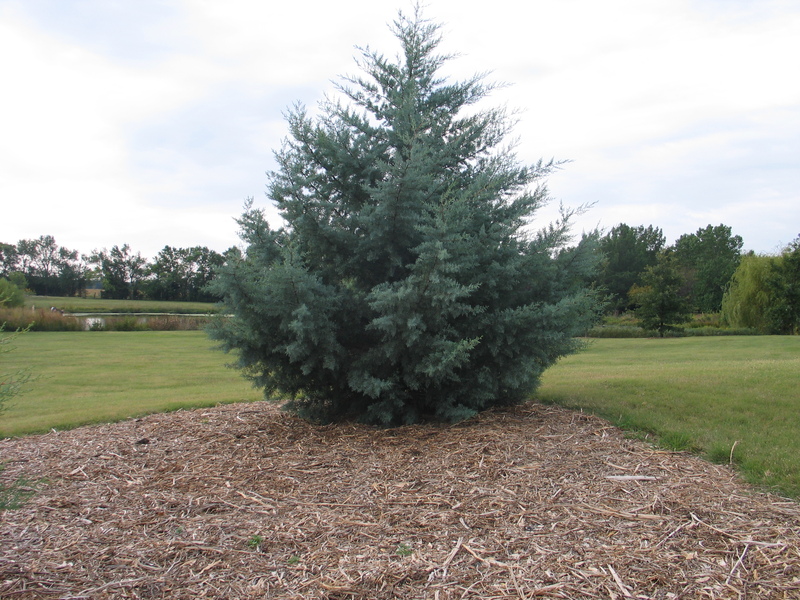 This tree adapts to most soil types, including heavy clay. Ours at the arboretum puts on good growth each year – one to two feet. Give it room to grow and you will be rewarded with an excellent shade tree. The fastest growing member of the red oak family is Shumard oak (Quercus shumardii) making it a great choice for the home landscape. Its native range is eastern Kansas along moist streams and upland rocky hillsides. It is quite adaptable to a wide range of soil conditions. The fall color can be incredible. 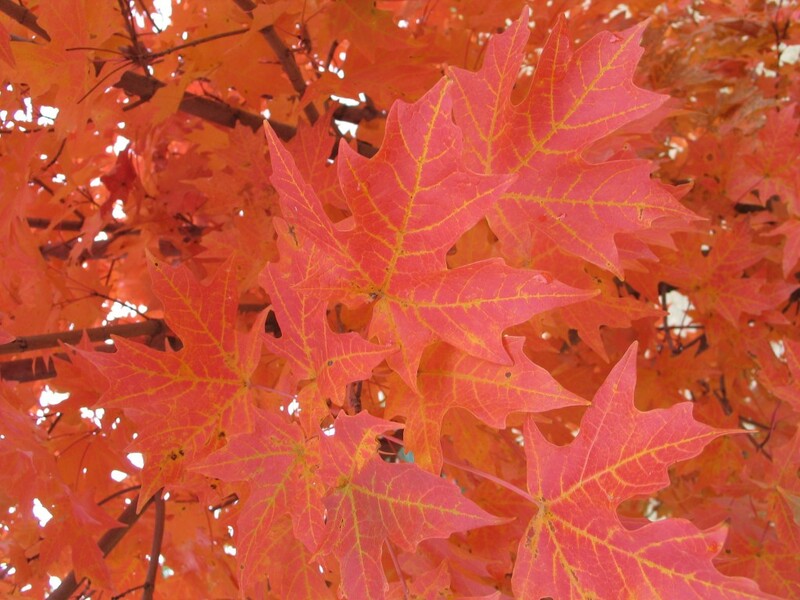 It is recommended that you choose your tree in the fall when they are coloring because the species can be variable in fall color intensity. 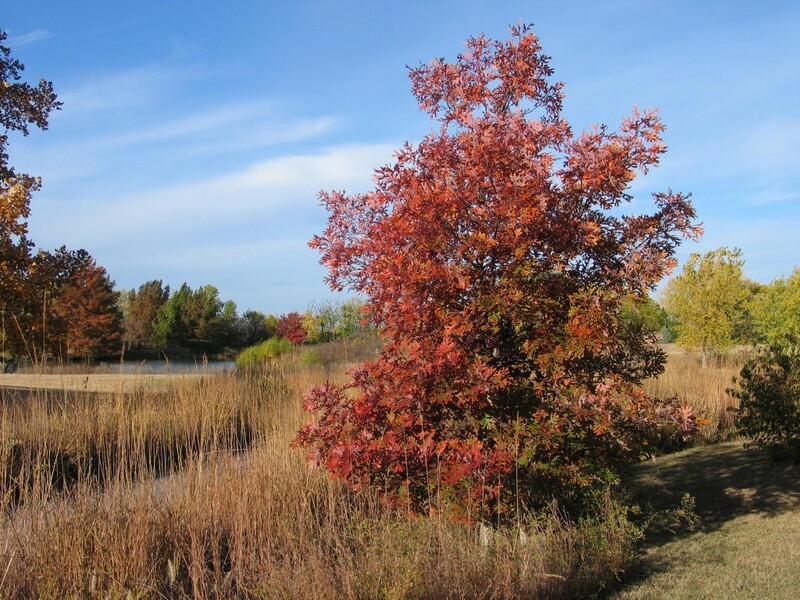 Shumard oaks are more tolerant than other red oaks of urban areas and challenging sites. Our shingle oaks (Quercus imbricaria) this fall have been spectacular. The red fall color was more brilliant than in previous years. The color fades, but the leaves will persist through most of the winter. Speaking of the leaves, they are unusual among oaks. They don’t have lobes, but are smooth along the margins. It is a great form that can thrive in drier conditions. They grow 40 to 60 feet tall and spread 30 to 50 feet. Planting an oak today is like leaving an inheritance to future generations. Choose wisely! What to Do with Those Leaves, Leaves, Leaves. The other day I was driving through town and really noticed the changing leaves for the first time this fall. They are looking particularly colorful this year. The Maple tree varieties like ‘John Pair’, ‘Autumn Splendor’, ‘Table Rock’ and Oaks like Red Oak and Shingle Oak put on quite a show. My favorite tree at the arboretum is the Sugar Maple called ‘Table Rock’. It has consistent orange-red fall color. These leaves, no matter how beautiful, will eventually fall. Then we need to decide what to do with them. Here at the arboretum we compost them. Leaf compost makes excellent plant food and humus that can be incorporated into your garden or flower bed. Leaf compost is high in valuable minerals such as nitrogen, phosphorus, magnesium, calcium and other trace elements. Analysis shows that leaves from most trees can contain up to twice as many minerals as aged manure. Why wouldn’t you want to make your own compost from leaves? Good compost developed from leaves also adds organic matter to the soil. This organic matter is great for aerating heavy clay soils or increasing water holding in sandy soils. Take advantage of these free gifts. Collect leaves. Shred them into small pieces to speed decomposition. Place leaves on the ground, which will make it easier to turn them and allow beneficial organisms such as worms to infiltrate the pile. To start your compost pile, your first layer should be several inches of leaves on the bare ground. This helps aerate the entire pile. Layer with alternating green (nitrogen rich) and brown (carbon rich) material. Green material can be grass clippings, food scraps, algae, tea bags or any nitrogen source. These green ingredients speed the decomposition of the brown material. Brown material can be leaves, newspaper, cardboard, sawdust, or straw. These ingredients are generally slow to decompose and clump together. They need time and moisture for optimum breakdown. As a general rule, try to have one-third green and two-thirds brown. The secret to a healthy compost pile is to maintain a working balance between these two elements. Too much green makes a smelly, anaerobic mess. More brown is better than too much green. Keep pile moist by either manually watering or allowing rain to infiltrate compost, but don’t go overboard. Turn the pile every few weeks. This incorporates and mixes all the elements together while aerating the pile. If the pile is never turned, oxygen, which is an essential component in the process of decomposition, will be excluded. Allow the compost pile to reach an internal temperature of 140-160 degrees to kill weed seeds. If your compost pile is not reaching these temperatures, add more green material. In 4-6 months (next spring) the composting process will be complete. If you don’t have need of fresh compost, the arboretum is willing to take your bagged leaves. 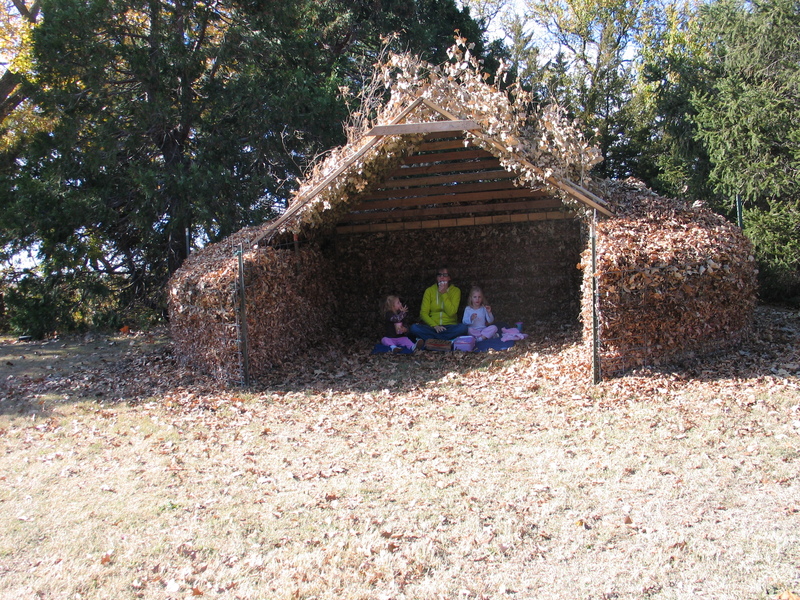 We are again filling our leaf house with our leaves, but we can take more. Just drop your bags of leaves in the bus parking area at the arboretum. We will take them back to the leaf house. The leaf house is a great example of decomposition in action. 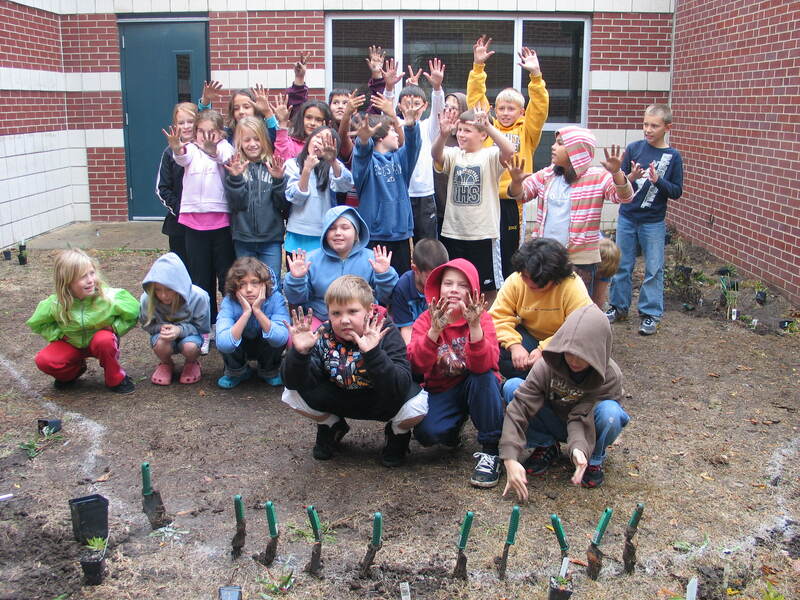 Kansas Earth Partnership for Schools (EPS) has become a flagship program at Dyck Arboretum of the Plains since we received training from EPS founders at University of Wisconsin-Madison Arboretum in 2006. 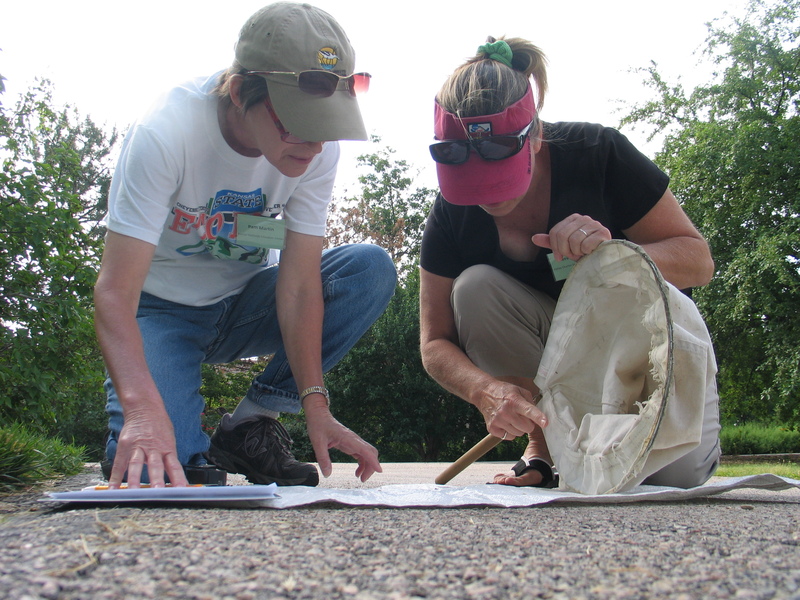 Over the last eight years, we have enjoyed helping 173 teachers form 58 Kansas schools pass along knowledge of the prairie to more than 21,000 K-12 students. 1. 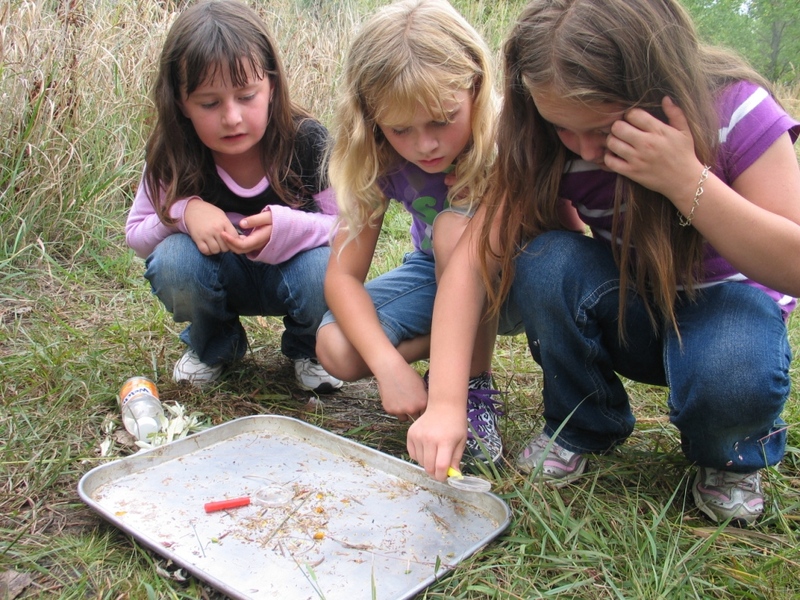 Kids thrive on outdoor, hands-on, project-based learning. When students get the chance to learn by doing and are asked to solve a problem in an inquiry based way, not only do they learn and retain concepts more effectively, but they also have fun in the process. 2. Improve student health and environmental literacy. Literature and studies show that each successive generation of students is becoming less connected to natural surroundings, more sedentary and more affected by real world problems, including attention deficit disorder and childhood obesity. The EPS Program helps schools address these problems. 3. 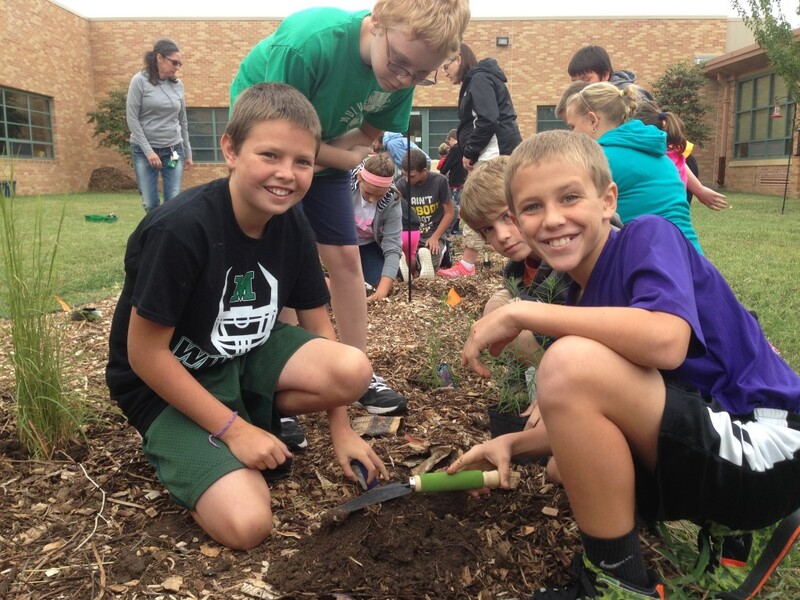 Add environmentally-friendly landscaping, biological diversity and aesthetic interest to school grounds with prairie garden learning laboratories. Once established, native plants survive, and often thrive, without irrigation, chemical fertilizers, herbicides or pesticides. They attract a host of insect pollinators and other wildlife too. 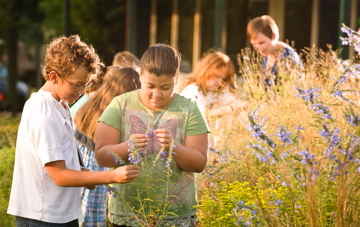 Prairie gardens also give students outdoor laboratories where all subjects of a school’s curriculum can be enhanced. 4. Teacher training can be fun! 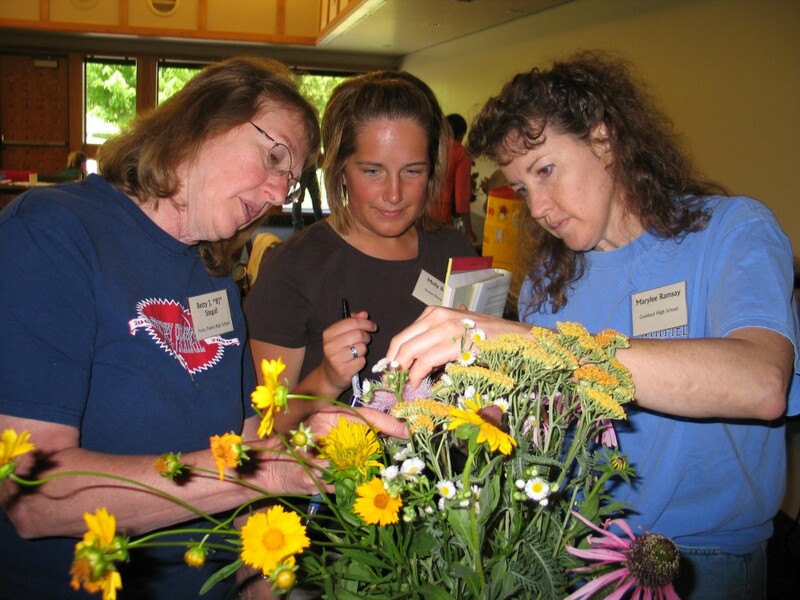 The EPS summer and winter teacher institute evaluations have clearly and consistently expressed that this Dyck Arboretum program gives teachers some of the most enriching, meaningful and enjoyable teacher training available today. And thanks to grant funding from generous donors, we have been able to provide this program with all of its follow-up support to teachers AT NO CHARGE. 5. Meet objectives of Common Core and Next Generation Science Standards. The new uniform national performance standards in schools are a reality for teachers and administrators, and the EPS curriculum has been fully correlated to these standards to give teachers a full toolbox of hands-on curriculum activities with which to work. Tell your favorite teacher to check our website and put the next EPS Summer Institute on the calendar! If you have questions, or would like to schedule an in-service to learn more about EPS, please use our contact form, or call our office and ask for Brad. 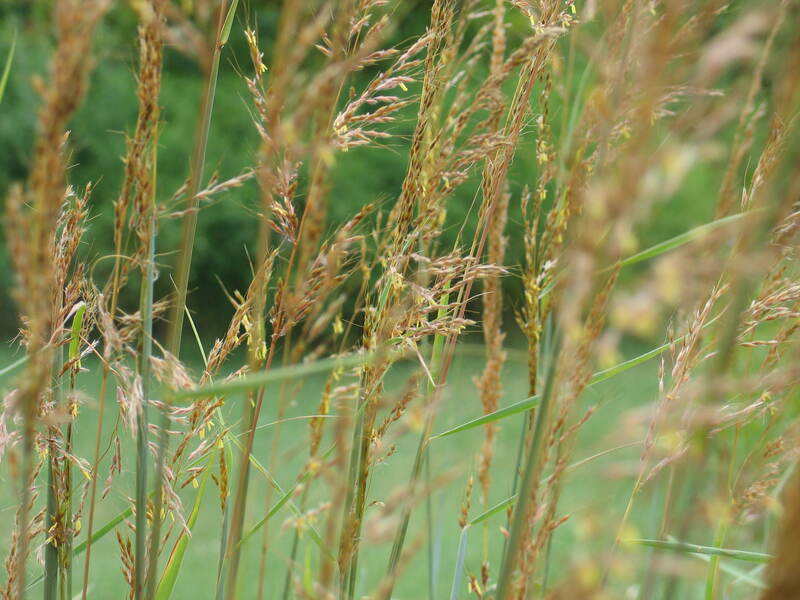 Native grasses are at their best right now. They are in full plumage. They are changing color from green to bold reds, yellows, and oranges. They have reached their full height. They are spectacular. I can’t imagine the view atop a rise looking over the expanse of the Great Plains in its unbroken state – a “sea of grass” as far as you could see. It must have been awe inspiring. Within these waves of gold and green, three grasses stood out from the rest. Within these waves of gold and green, three grasses stood out from the rest. This is the king of the prairie grasses, reaching to the skies and sending its roots deep. It perseveres in tallgrass prairies. The vertical stems stand firmly and sway with only a slight breeze and change vibrantly in the fall to shades of red and orange. The three-pronged seed heads resemble a turkey’s foot, hence its other name “Turkey Foot Grass”. Plant it in full sun in a medium to moist soil. The airy seed heads and upright habit make this a great landscape grass. These forms make quite a statement in the fall and winter landscape. They add structure, texture and movement. For best results, plant them in a sunny spot in a medium to moist soil. It is very drought tolerant. Discover these varieties: ‘Northwind’-consistent upright form to four feet tall and golden yellow fall color, ‘Cheyenne Sky’-red leaves develop early in the summer and grows to three feet, and ‘Dallas Blues’-tall (to 8 feet), with blue foliage and purple seed heads. 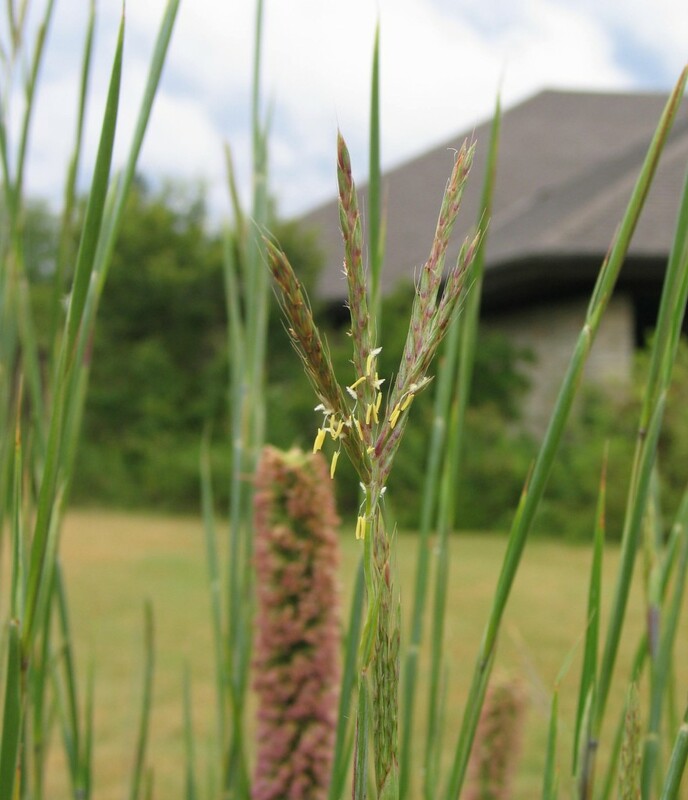 The yellow/tan plumes and vase-shaped habit make this grass easy to recognize in prairies. I use them in naturalistic plantings or formal plantings. Give them space, because mature plants can be five feet across the top. It grows best in a medium to dry soil and all-day sun. Heavy clay soils make it robust, but it thrives in many different soil types. These native grasses are the backbone of the tallgrass prairie. They are resilient because their roots go deep making them drought tolerant and tough. They are garden-worthy and deserve a place in the landscape. Give them a try. You will be rewarded for many years to come. 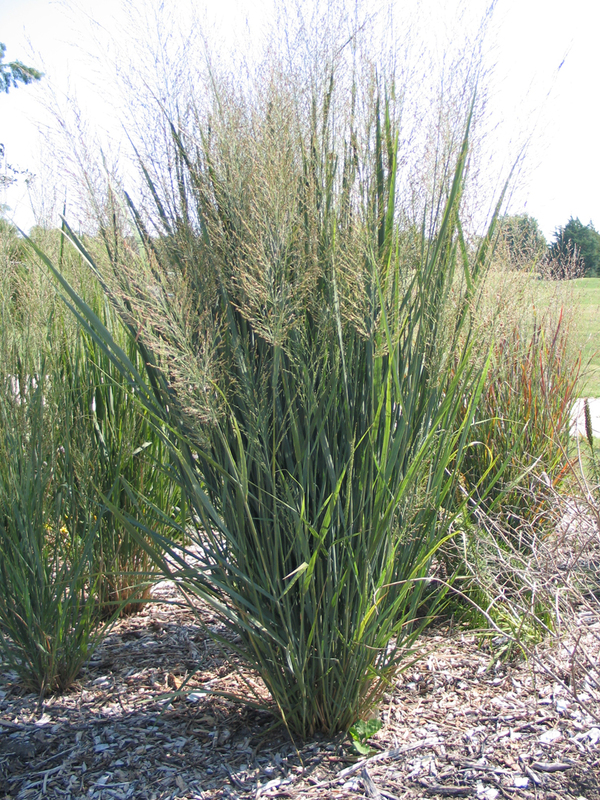 Check out this article in Fine Gardening that I wrote several years ago for more information on other native grasses. This is my favorite time of the year. I love autumn. You can see and feel the changes of the seasons. Prairies turn from green to brilliant shades of red, orange and yellow. Trees light up the landscape with vibrant fall color. Asters dot the landscape as pollinators search for the last remaining nectar in the garden. There is so much to enjoy this time of the year. We don’t want to think about the real big change coming when winter arrives, but that change is coming all too soon. I like to spend some time in the fall preparing our landscapes for winter. By dedicating some time now to your landscape, you will be rewarded with healthier, more beautiful plants next spring. Fall is a great time to mulch all your plants. Mulching now will help protect roots from extreme temperatures while also helping the soils to retain moisture in a typically cold, dry winter. We apply 2-3 inches of new mulch around perennials, trees and shrubs. Be careful! 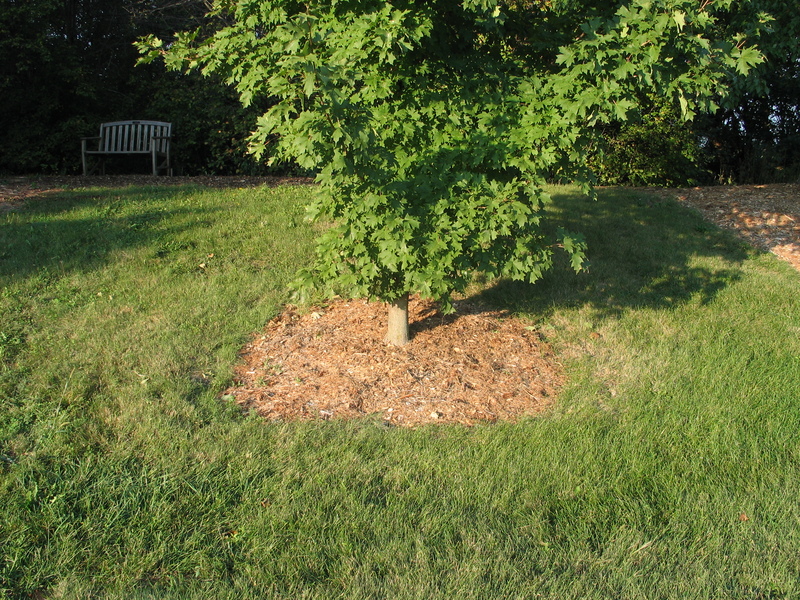 Don’t allow mulch to contact the stem or trunk. We leave a halo around the plants to aid in air exchange and drying. Too much mulch can cause more harm than good. This is the best time of the year to plant a new fescue lawn or overseed an existing fescue lawn. I overseeded my back yard last week. It is just starting to germinate. I used clean, weed free seed and watered it daily. I applied 3-5 lbs. per 1000 square feet. If you are planting a new lawn, apply 5-10 lbs. per 1000 square feet. You have until October 15 to get your seeding finished. It is usually too late to seed after October 31. The cool nights, warm days, beneficial rains and less weed competition make this time of year ideal for seeding grass. It is also the best time to fertilize your fescue lawn. We apply one pound of nitrogen per 1000 square feet. Fall fertilization promotes root growth. The roots of the fescue absorb and store the nutrients for the winter. This stored energy will make for a thicker, healthier lawn next spring. Remove leaves from lawn and place in compost pile. Falling leaves block sunlight to the grass inhibiting growth. Leaves can be shredded and composted into the lawn, but often this causes more problems. It is usually best to completely remove them. Remove Annuals and Cut Perennials: After the first frost, annuals can be removed from the landscape. Prior to the first hard freeze, tender annuals need to be dug up and stored for the winter (i.e. cannas and elephant ears). In certain gardens, we deadhead spent blooms on plants such as gray-headed coneflower and coneflowers to prevent seeding. 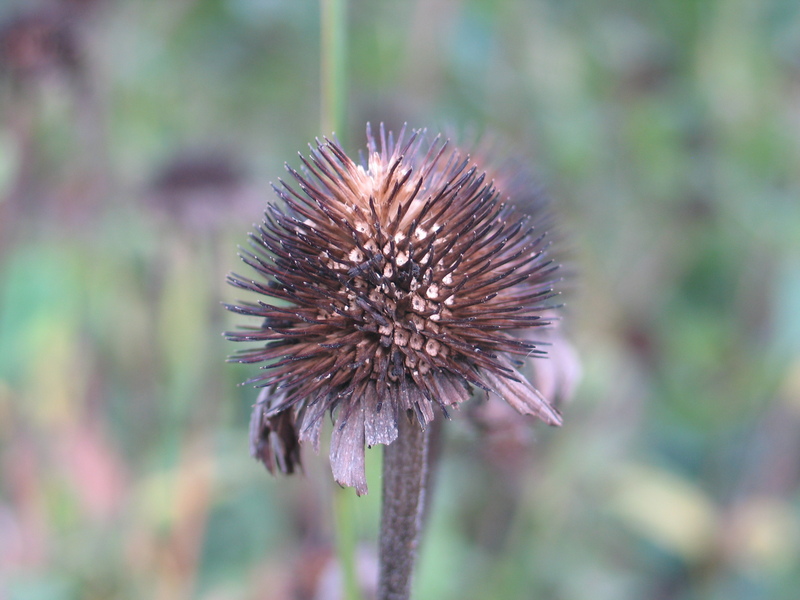 Other seedheads are left through the winter as food sources for birds. We leave ornamental grasses through the winter. They provide texture and movement in the winter landscape. These beds will be cleaned up in the spring. 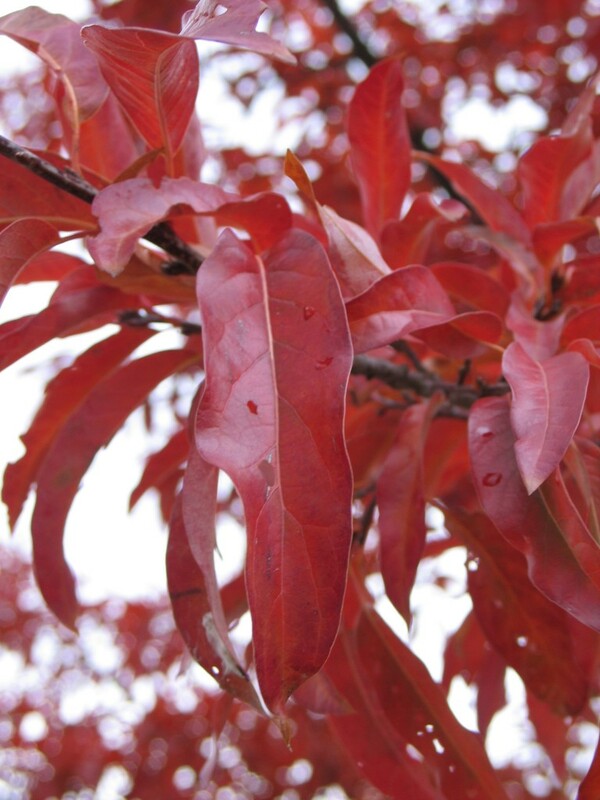 Keep in mind that fall is NOT the best time to prune trees and shrubs. It encourages new growth that will not get hardened off before winter, making it susceptible to damage. Prune trees in the winter after they have gone dormant. Shrubs can be pruned in the winter as well but only if they bloom on new growth. Pruning spring blooming shrubs in the winter will remove next year’s blooms. Prune these after they have finished blooming in the spring. 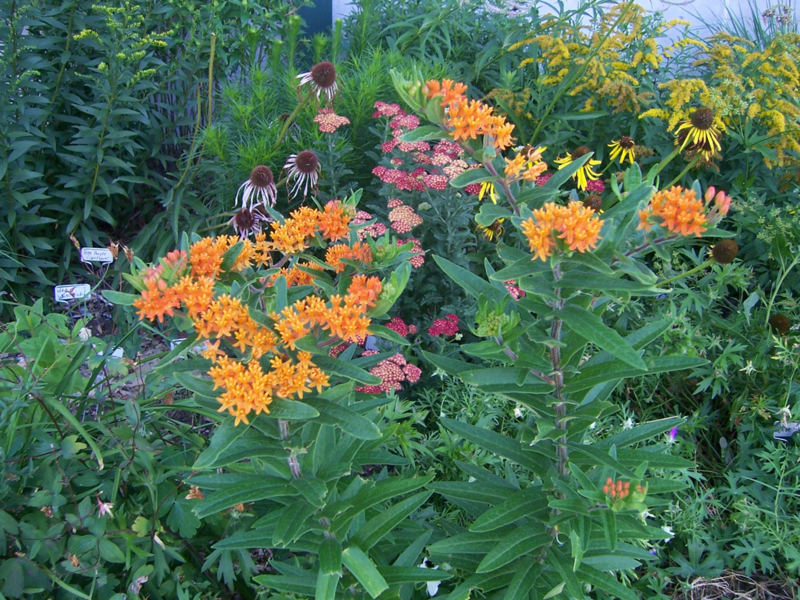 It is vital that perennials, trees and shrubs are adequately watered throughout the fall. Newly installed plants don’t have a fully established root system and would benefit from periodic watering. If the top 1-2 inches of soil is dry, the plants need water. Evergreen trees continue to need moisture in winter, so irrigate thoroughly before the ground freezes. In the fall, I analyze the landscape. This is the best time to determine what your needs will be next spring. What plants did well in the landscape? What plants need help or need to be moved next spring? Are there any plants that would benefit from dividing such as grasses? What areas need to be filled next spring? Does the canopy of the trees need to be thinned to allow more light into the landscape? Install spring blooming bulbs before the ground freezes. This is a great season of the year. Take some time to appreciate the beauty of fall. There is so much to enjoy, but set aside some time to prepare for the winter. A little work now on your landscape will pay big dividends in the spring.